The Overland Telegraph Line - lines and cables from Europe to India. The history of the England to India cables is long and detailed. Some details of the story can be obtained elsewhere as well as in the excellent review in The Australasian of 6 July 1872. The first lines from Europe to the East focussed on India. One map - probably prepared about 1870 - shows in part the telegraph routes already constructed or being constructed to that point in time. The top line to the north of the Black Sea was referred to as the Indo-European Line of Telegraph. Also note that the Indian city of Kurrachee is now Karachi in Pakistan. 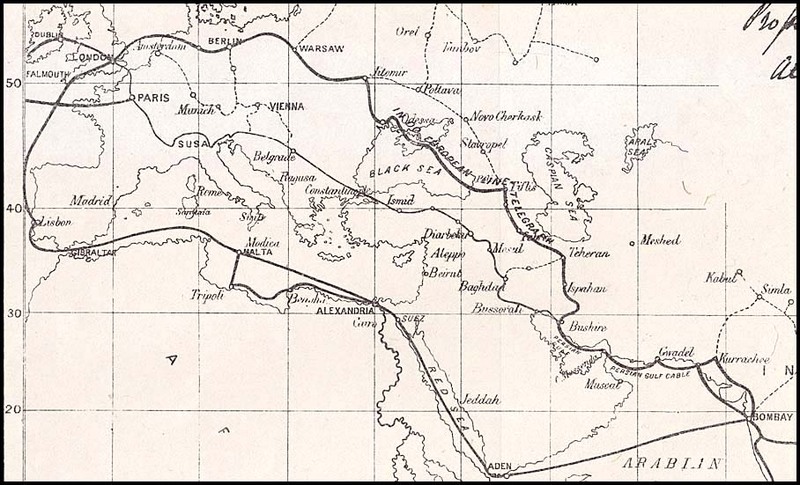 The line through Teheran, Bushire and Gwadel, for example, were only proposed after the Prospectus for the Indo-European Telegraph Company had been issued. The alternative route to that described in the north was that through the Mediterranean. It was described in part in the Australasian report of 1872 noted above. A major part of the planning for the Mediterrean route was the submarine cable from Alexandria to Malta to provide a primary and improved route to the land route. It was laid by the Anglo-Mediterrean Telegraph Company (John Pender Director). After that cable had been laid in 1866, the cable from Malta to Gibralta and thence to England could be laid. The completion of that link then enabled messages from England to connect with the mail route from Alexandria to India. Ships laying the cable from Malta to Alexandria. The Illustrated Lindon Times 21 October 1868. In 1867, the Governments of Queensland, New South Wales, Victoria, Tasmania, South Australia, Western Australia and New Zealand met in Melbourne to discuss "OCEAN POSTAL COMMUNICATION". Also on the agenda was a discussion about the possibility of telegraphic communication being extended from India to the Australasian Colonies. proposals for routes from India to the British and Dutch Colonies in the east and thence to Australia. These proposals did not consider the route described elsewhere of linking Bombay to Ceylon and then through to Batavia and on to Western Australia. Extracted from the 1867 Conference of Oceam Postal Communication. In his Report to December 1861, McGowan noted that "the untoward failure of the Aden and Kurachee line having of course seriously interferred to interrupt the proposed extension from India via Java to Australia, and the several failures of other deep sea lines tending in a great measure to retard at least for the present any immediate action relative to the Australia connection ... more especially when it is remembered that according to last accounts the cable between Singapore and Batavia hed proved almost a total loss". It needs to be restated here that McGowan was writing five years before the Atlantic cable was successfully laid. 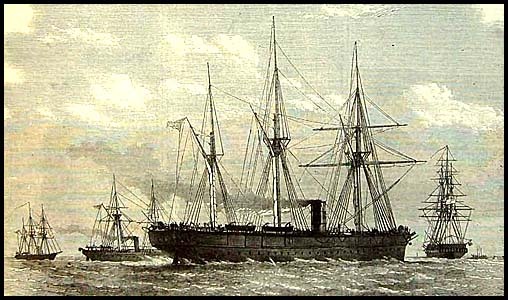 The Argus reported as follows on 16 September 1862: "A letter was also read from Sir Francis Gisborne, of London, secretary to a proposed Anglo-Australian and China Telegraph Company, pointing out the advantages to be derived from the proposed scheme - one great result of which would be to place Australia in much speedier communication with England. Australia would, in short, be placed on the same footing, as regards the telegraph, as India now was. The letter was referred to the Legislative Committee for consideration". In 1864, the Persian Gulf cable was successfully laid and a line via Constantinople and Baghdad to Kurachee was completed in 1865. Main page for the Overland Telegraph Line and the cables.